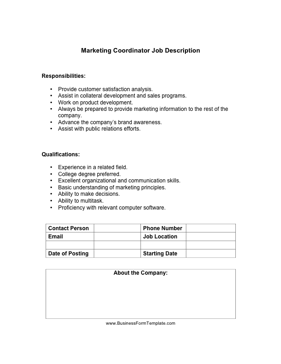 This marketing coordinator job description outlines the basic education and experience qualifications for marketers, as well as their projected office duties and responsibilities. Assist in collateral development and sales programs. Always be prepared to provide marketing information to the rest of the company. Advance the company's brand awareness. Assist with public relations efforts. Proficiency with relevant computer software.